"Find&Invest Capitals: from the entrepreneurial idea to its realization." WorldVideoBusiness - WVB® - is committed to constantly update its database to offer you a complete directory of Venture Capitalist Firms! 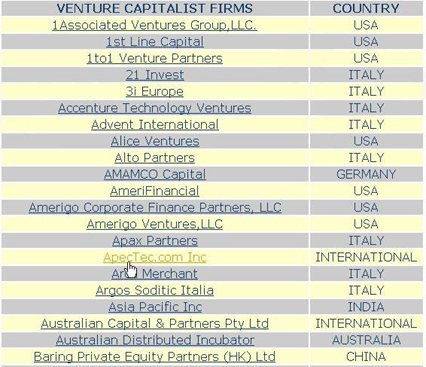 Just click on the links below to take a closer look at the Venture Capitalist Firms interested in your industry. WorldVideoBusiness - WVB® - is committed to constantly update its database to offer you a complete directory of Merchant Banks! 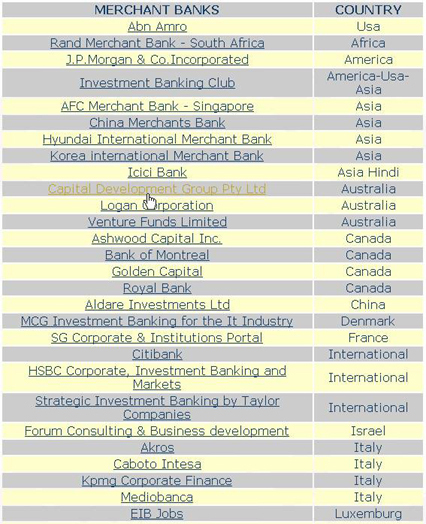 Just click on the links below to take a closer look at the Merchant Banks interested at your industry. 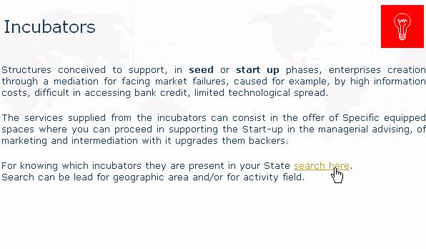 For knowing which incubators they are present in your State. Search can be lead for geographic area and/or for activity field.